IT'S ALWAYS SAD WHEN A FELLOW HHS HORNET PASSES AWAY. EVEN MORE SAD WHEN THE DECEASED IS A CLOSE FAMILY MEMBER. MY SISTER IN LAW, (JUDY'S SISTER) DOLORES "DOEY" BRITTON PAUL, CLASS OF '46, PASSED AWAY ON SATURDAY, JANUARY 26TH AFTER A LENGTHY ILLNESS. UP TO THIS POINT, FELLOW HORNET JACK LACY, HHS '56 HAS BEEN THE ONLY HORNET TO KEEP ME UPDATED ON THE PASSING OF HAMILTON ALUMNI. IF YOU HEAR OF ANY OF YOUR CLASSMATES WHO HAVE PASSED AWAY, PLEASE EMAIL ME SO HE OR SHE CAN BE INCLUDED ON OUR HHS51 BLOG. Much as I dislike being the bearer of bad news, sadly I report the passing today of our HHS56 classmate Art Julian. 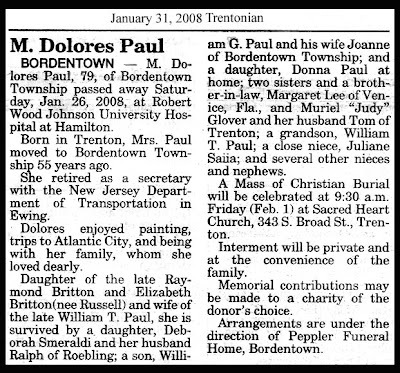 Arrangements are incomplete but remembrances can be sent to his daughter Sharon (Julian) Dunham, 12 Milburne La., Robbinsville, NJ 08691.